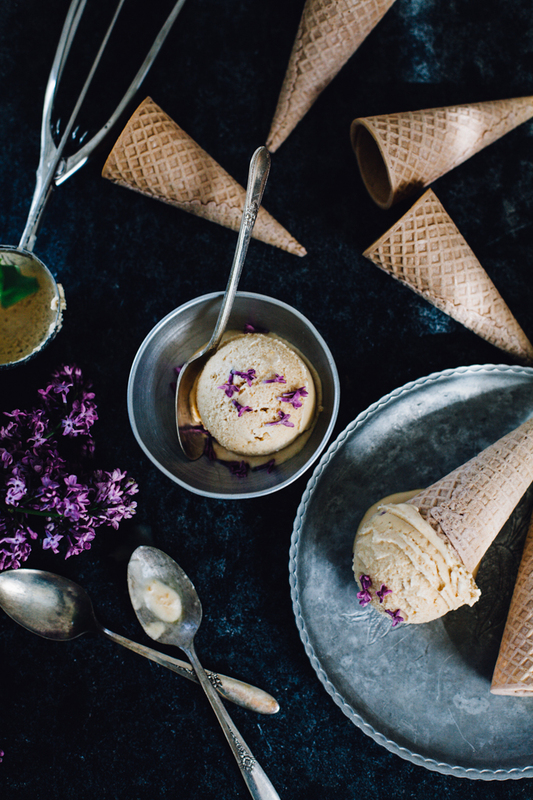 Lilac Lemon Grapefruit Sherbet & an Edible Flower Virtual Potluck! Every year Spring explodes into soft, intoxicating beauty which then just as quickly fades away. It's bittersweet, knowing that the cherry blossoms drift away to make room for Summer's sweet fruit. I want to hold onto those bright blooming moments and melt into them. Tie a bit of those elated pinks and yellows and purples to my life and carry them around like balloons always. Although I love the intensity and juiciness of Summer, I always briefly mourn the loss of the sweetness of April and May. So this year in an effort to honor all of the beauty of the season (and perhaps capture a bit of its essence) I invited a gaggle of brilliant bloggers to join me in posting recipes with edible flowers! So today I get to celebrate great bloggers AND Spring beauty. Today all over the internet you'll find an especially high concentration of floral foods and pastel hearts-in-eyes. You're welcome, Pinterest, for all of the dreamy, girly beauty we just launched into the internet. Check out the Edible Flower Virtual Potluck Posts! And you can follow along by searching the hashtag #frolicforflowers ! >> Read on for the Sherbet Recipe! This sherbet. It's a riff on the Sprouted KitchenBowl + Spoon Grapefruit Lillet Sherbet. And it's my new best frozen friend. My dad and I always bonded over a shared love of sherbet and sorbets. (And coconut anything.) We often had a lil tub of neon, rainbow striped sherbet in the ice box. Sherbet, unlike ice cream, is fruity and tart and refreshing. Where ice cream is rich and sensual and alluring, sherbet is light and flirty and vibrant. Both are good, in different ways. Like Brunettes and Blondes, they're both fabulous -- but you can't help but be more attracted to one or the other. I'm still always way more into the sorbet and sherbet flavors -- although cold brew coffee ice cream is MY JAM. As a grown up with a strange affinity for less sweet / more healthy things, the sticky sweet sherbet of my youth holds zero appeal. I still want some tangy-sweet sherbet dripping down my wrist and out of my ice cream cone on a hot day. But I want a better, real-food version. Here I've combined semi-sweet grapefruit and tart lemon juice for a complex citrus flavor. I mellow out the intense tartness with earthy coconut sugar, which acts like brown sugar. The molasses notes in coconut sugar ground the acidity and create a more well-rounded flavor. I added a touch of St. Germaine Elderflower Liqueur to play off of the tart-sweetness. I think it throws in a bit of interest, especially if you add lilacs into the mix. The lilacs are more of a garnish than anything else*. Their sweet perfume adds a lovely, subtle, sweet flavor. *Harvest fresh lilacs from lilac bushes that you can confirm were not sprayed with pesticides, or buy your lilacs from an Organic florist. Lilacs are in the olive family, and are 100% safe to eat. They're more pleasant for their aroma, and less for their flavor. Use them as a garnish on all sorts of things! I like them on smoothie bowls, over a salad, and they make a grilled veggie plate look totally dreamy! Tangy, creamy, and refreshing, this dairy free sherbet is the perfect match of citrus and floral flavors like elderflower and lilac. For a kid-friendly version, omit the liqueur. Mix together the grapefruit and lemon juice. In a medium saucepan, combine 1 cup of the mixed juice with the lemon zest and coconut sugar. Place over low heat until the coconut sugar is just dissolved, stirring occasionally. Mix the sweetened juice together with the rest of the citrus juice, coconut milk, and St. Germaine. Add the sorbet base to the bowl of a high powered blender and blend on high until the texture is creamy and even. Place the sweetened juice in a glass container and cool completely in the fridge, until cold -- at least 2 hours. Add the sorbet base to your ice cream machine and make according to your ice cream makers directions. Spoon the sorbet into a loaf pan (I like to line mine with parchment paper) and freeze until the sorbet is firm, around 3 to 4 hours. If you freeze overnight let sit out at room temp for a bit before serving, as sorbet can get quite hard. 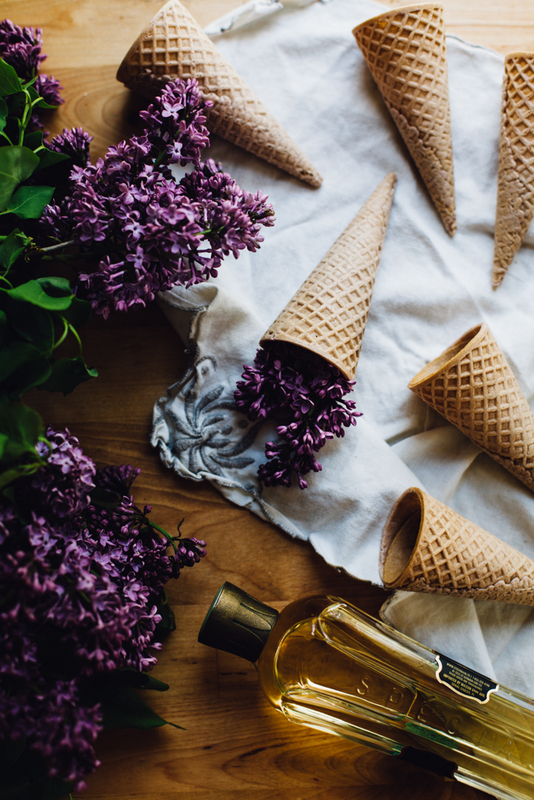 Scoop the ice cream out and serve topped with fresh lilac buds, or to your liking. Scoop them into ice cream cones if you like!